The BDA has revived 2nd Fridays as an inclusive series of events which will encompass ArtWalk, while also showcasing local shops, restaurants, and artistic talent from a variety of mediums. This event is intended to give residents and visitors a unique opportunity to engage with the arts. 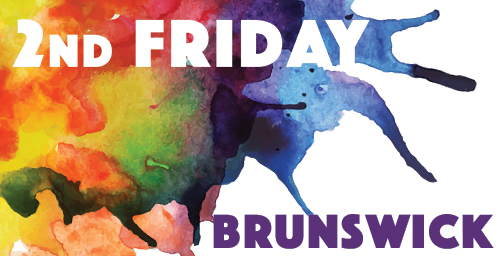 2nd Friday Brunswick offers a fun evening of artistic exploration featuring visual art, live music, dance and theatrical performances, and extended shopping hours all within walking distance of Maine Street. On-street parking and municipal public parking lots are free. The 2nd Friday Brunswick event will occur from 4 to 7 p.m. on the second Friday of each month from June through September, (June 8th, July 13th, August 10th, September 14th). Event festivities will include an ArtWalk with over 30 artist displays in downtown galleries, retail shops, restaurants, and on the street. Artists interested in participating in 2nd Friday Brunswick can register at: 2ndFriday-Artists-18. Questions? Downtown businesses and organizations interested in becoming a 2nd Friday Brunswick venue and hosting an artist should email admin@brunswickdowntown.org or call 207-729-4439.